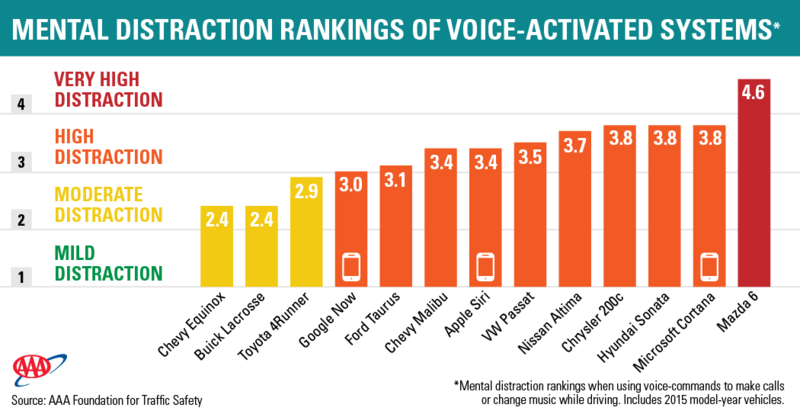 A new study by AAA Foundation for Traffic Safety, Measuring Cognitive Distraction in the Automobile III: A Comparison of Ten 2015 In-Vehicle Information Systems (October 2015), examined the effect of several different In-Vehicle Information Systems on mental performance while driving. Participants of the study were asked to complete voice initiated tasks such as dialing a phone number, placing a call to a contact or making a song selection. One finding to note, it took up to 27 seconds for the driver to return their full attention back to driving after completing a task. The driver’s hands were on the wheel and eyes were on the road, but for 27 seconds their mind was not on driving. 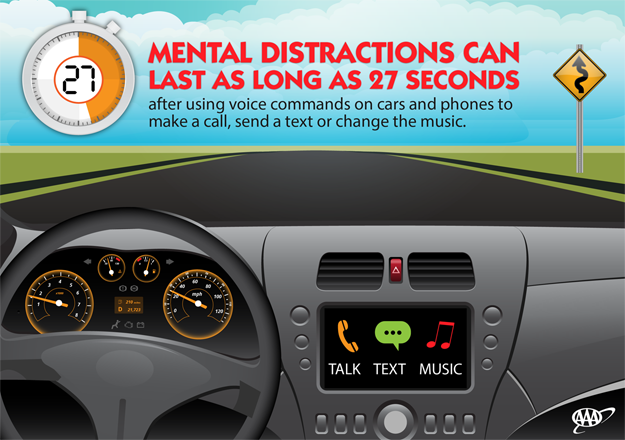 Driving needs your complete attention and involves continuous and complex coordination between your mind and body. The study also revealed that practice does not may perfect. Participants kept a vehicle for five days to familiarize themselves with the technology. Even after a week of practice, activities required about the same amount of mental concentration as when it was first attempted. No matter what potential distractions await you while on the road, it is up to you, the driver, to always focus on your driving.